[Tomatoes, Malt Vinegar (from Barley), Molasses, Glucose-Fructose Syrup, Spirit Vinegar, Sugar, Dates, Modified Cornflour, Rye Flour, Salt, Spices, Flavourings, Tamarind]. Spice up your cooking by adding a dollop of HP sauce to your favourite recipes. Daddies Brown Sauce. Spirit Vinegar, Water, Glucose-Fructose Syrup, Molasses, Malt Vinegar (from Barley), Sugar, Dates, Modified Cornflour, Rye Flour, Salt, Spices, Onion Extract, Flavouring. Chef's Larder Brown Sauce. Spirit Vinegar. FSA 2012 salt target compliant. Tomato Paste. Bottle shape may be different to that shown. No artificial colours. Acidity Regulator (Acetic Acid). Rye Flour. 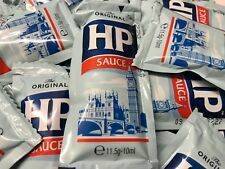 Lovely Brown Sauce Sachets just like you get in the Cafe. 50 Portions of HP Brown Sauce each 12g. Total Fat 0.0g. Calories 34 Calories from Fat 0. It’s a Ketchup with a twist, give it a try. Tomato Paste, Vinegar, Golden Syrup, Habanero Mash (4%), Salt, Cornflower,Mustard, Celery, Spices. Allergens listed in Bold. May contain traces of nuts. 50 Tomato Ketchup & 50 Brown Sauce 9.5g sachets. Hammonds Chop Sauce ( Yorkshire fruity brown sauce) and Rarely available. Squeezy Bottles. Tomato Sauce & Brown Sauce. 2 Sauce Bottles. Plastic Bottles. [Fruit (Tomatoes, Dates, Oranges, Tamarind), Glucose-Fructose Syrup, Malt Vinegar (from Barley), Sugar, Spirit Vinegar, Modified Cornflour, Mango Chutney (Sugar, Mango, Salt, Vinegar, Chilli, Spices), Molasses, Rye Flour, Salt, Spices, Flavourings, Pectin]. 50 Tomato Ketchup & 50 Brown Sauce 10g sachets. Traditionally Rich and Fruity. FRUITY SWEET PICKLE SAUCE. FSA 2012 salt target compliant. No artificial colours. Suitable for vegetarians. 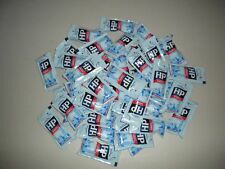 50 x HP Brown Sauce Sachets 11g. Tomatoes, malt vinegar (frombarley ), molasses. Glucose-fructose syrup, spirit vinegar, sugar. The superb taste of HP Sauce in a small sachet. HP Sauce – Ingredients. Tartare Sauce. Tomato Ketchup. Malt Vinegar. English Mustard. Brown Sauce. Salad Cream. Hammonds Chop Sauce ( Yorkshire fruity brown sauce) and Rarely available now. Made with date purée & black treacle. Our own original and unique recipe. This product contains no artificial colourings, flavourings or sweeteners. Suitable for vegetarians. Brown sauce. We like our food simple, good and delicious so we make our sauces that way too. Tiptree Brown Sauce. Brown Sauce. Full Of Flavour. Hammonds Chop Sauce ( Yorkshire fruity brown sauce) and very rarely available now. This sale is for. Buy while you can if you're a fan!